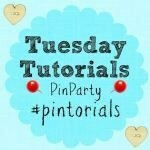 A huge welcome to Week 37 of the Tuesday Tutorials Pintorials Pin Party! I particularly love this time of the year with brisk air and changing leaves. Hooray! Autumn have arrived! This week I am featuring Autumn leaf crafts. I love A Pinch of Perfect’s leaf candle! Preserving the leaves onto the candle, they simply look gorgeous! Next is Mommy Crusader’s children who made a beautiful five minutes fall leaf center-piece! I could have that for my living room! Next is Mum in the Madhouse who made a gorgeous watercolour resist leaf garland. Last but not least is Domestic Mommyhood who made use of an old puzzle to create a beautiful fall puzzle tree! Don’t they look gorgeous! Don’t forget to pop by to take a look at Kate (Spider Craft), Anna (pumpkin activities) and Hodge’s (R craft for kids) blogs to see who is featured this week.